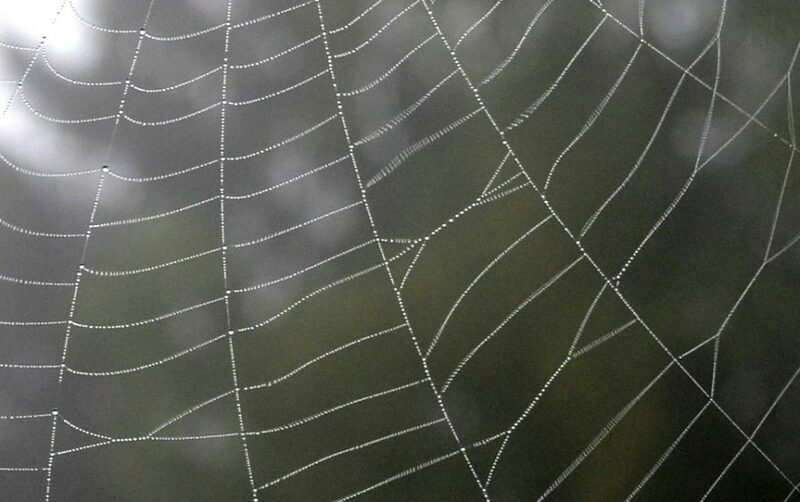 We have all been mesmerized by the immobile strings of thousands of pearls found on a spider web on a rainy day. What if these pearls could slide ? Droplets on a spider web. In these experiments, we have observed millimeter-sized oil drops sliding on inclined nylon fibers. Or more exactly rolling, as microparticles within suggest. We could show that the drop reaches a terminal velocity that results from a balance of gravity and viscous dissipation. But it still slows down on the long term, because it looses mass in its wake: the fiber gets coated in agreement with the Landau-Levich theory. An oil drop containing microparticles slides down an inclined nylon fiber and leaves a coating film in its wake. The same happens on vertical fibers. Surprisingly, the sliding drop prefers the barrel shape (axisymmetric) to the clamshell shape (asymmetric), though the former dissipates more than the latter. When a drop encounters an intersection with a horizontal fiber, its weight gets opposed by the upward capillary forces from this fiber. As a result, small drops are blocked, while large drops can cross the intersection. The maximum volume that can be held by the fiber is well-defined, and the transition from blocking to crossing is sharp. Drops are afraid of falling too fast. So they always end up wrapping the fiber in order to slow down. A horizontal fiber intersecting a vertical one is a sharp size filter. Only drops of volume larger than a certain threshold can pass the intersection, while smaller ones are blocked by capillary forces. Division of a sliding microliter oil drop into tens of immobilized droplets. Now if we place several intersections in series, we obtain… a drop splitter ! A large drop would cross all the intersections. But it would coat the fiber in its wake. This coating turns into a string of droplets owing to the Rayleigh-Plateau instability. These droplets slide down until they get collected by the horizontal fibers. The result is a fairly monodisperse population of tens of droplets, produced in a fraction of second and immobilized at the intersections. If we now rotate the device by 90°, the horizontal fibers become vertical, and droplets of another fluid can be brought to the intersection. Merging, mixing, then possible incubation and biochemical reaction… It is like pipetting a sample into 96 wells then bringing a different reactant for each, except that you don’t need any robot. In other words, it is digital microfluidics… on a wire ! Some more research on this topic has been done by Floriane Weyer in Nicolas Vandewalle’s team. Check their paper in Soft Matter.